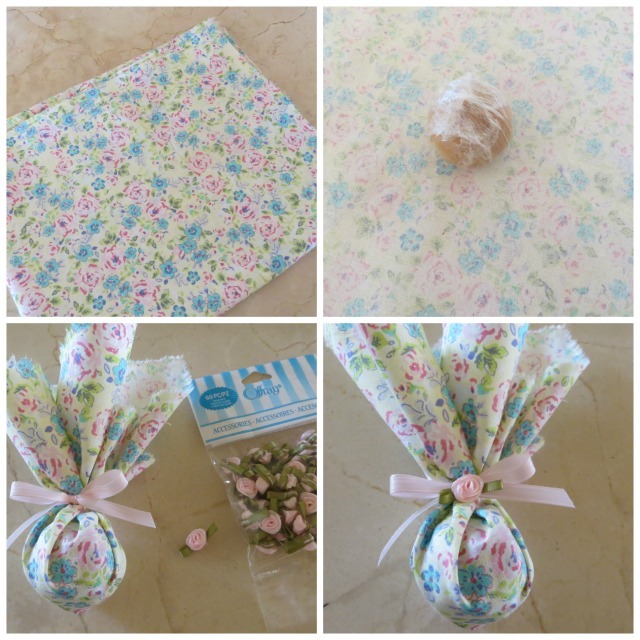 The Partiologist: Another Way to Serve Cake Pops! Another Way to Serve Cake Pops! Today, it's not how you decorate, it's how you package that can turn simple cake pops into a shabby chic dessert! After finding a cute little bike (photo below) with a place to hold a plant, I knew exactly what I wanted to do and it didn't involve dirt. I found the fabric, ribbon and bows, just couldn't decide what to put inside. I knew I wanted it to be round... not too big (a popcorn ball) or too small (a truffle) something just right. Yep, I could be Goldilocks. Finally it came to me. A cake pop, a simple cake pop just dipped, not decorated. Yes, it was just right! And if you think I just ran to one shop and found the perfect fabric, think again. I first went to Joann Fabrics, found this fabric but didn't know if it was the one. So I left and continued to a few other stores. You know, that's how I roll, I find something and then I keep searching until I realize I liked the first one best. Then I went back and purchased the fabric, hoping my math was correct to make enough squares to wrap each cake ball. Well, let's just say, my math was a little off and I ended up with extra fabric. I was happy about that because most of the time it's the opposite and I am one short. Anyway, here's how to turn your cake pops from shabby to chic. 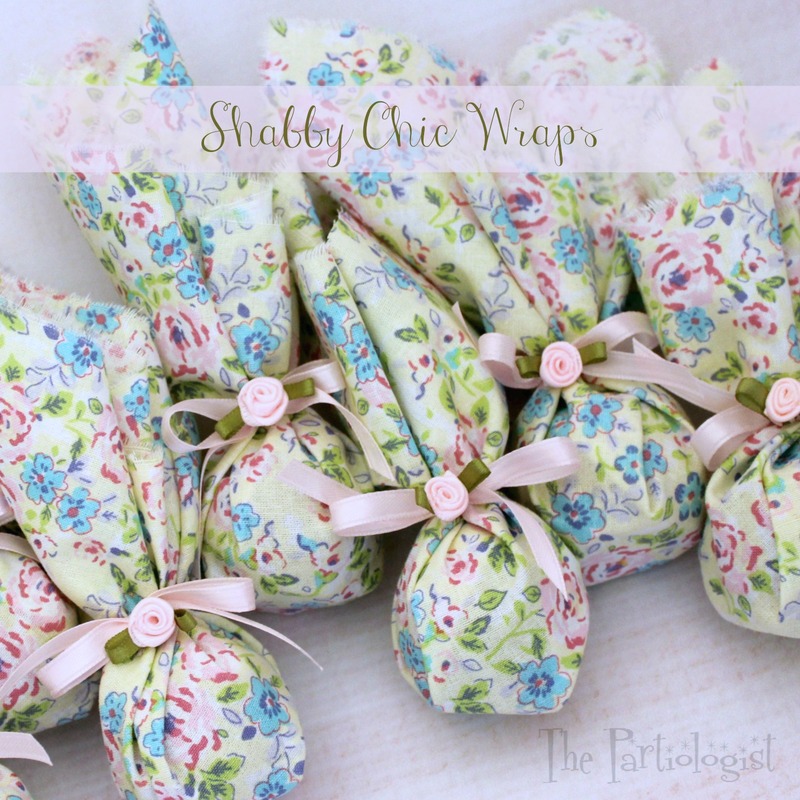 Seriously, you could wrap anything or any size you want, you may not be Goldilocks. Instead of cutting the squares needed for wrapping, I cut just a slit and then I tore the fabric, leaving the edges frayed. Frayed edges are shabby, right? After making and dipping the cake pops, I let them set and removed the stick. Then I took the 'just right size' cake pop and wrapped each in saran wrap. 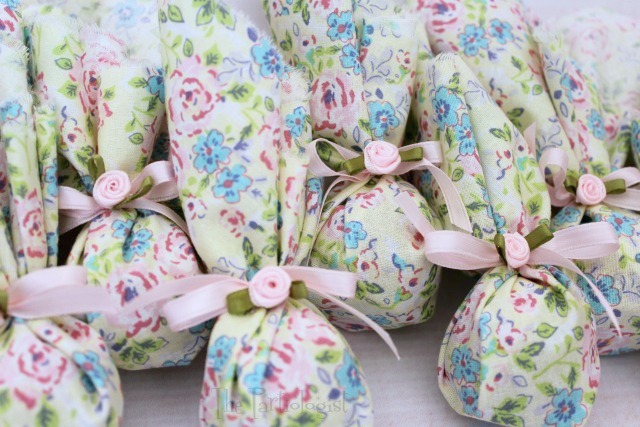 Place one cake pop in the middle of the square, wrap the fabric up around and tie it with a pink ribbon. I also found the tiny pink roses at Joann Fabrics and hot glued one to the middle of each ribbon. Cutest little cake wrapper around! And the little bike ready to ride. I added natural grass to the bottom of the basket to hold the cake pops a little higher for the party. 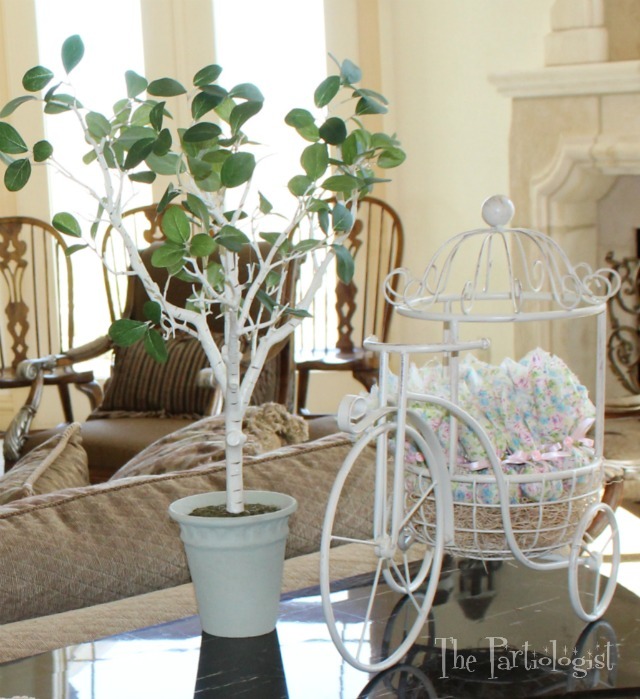 Next to the display of shabby chic cake wraps, was the little tree I planted. Just Kidding. It was the perfect way to display the cake pops, don't you think? And by switching out the fabric, they could be made for any occasion! 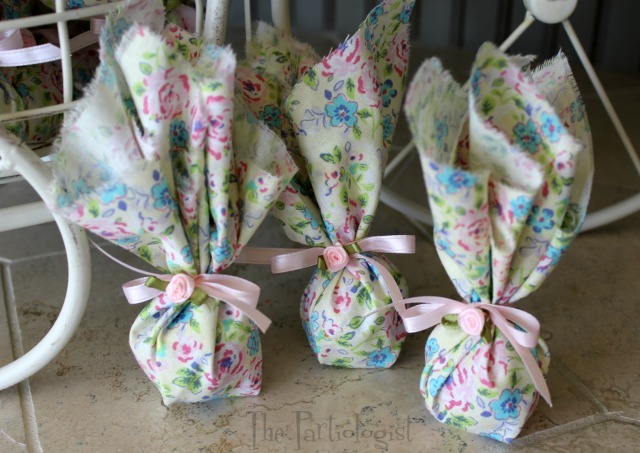 Cake pops so shabby they're chic! 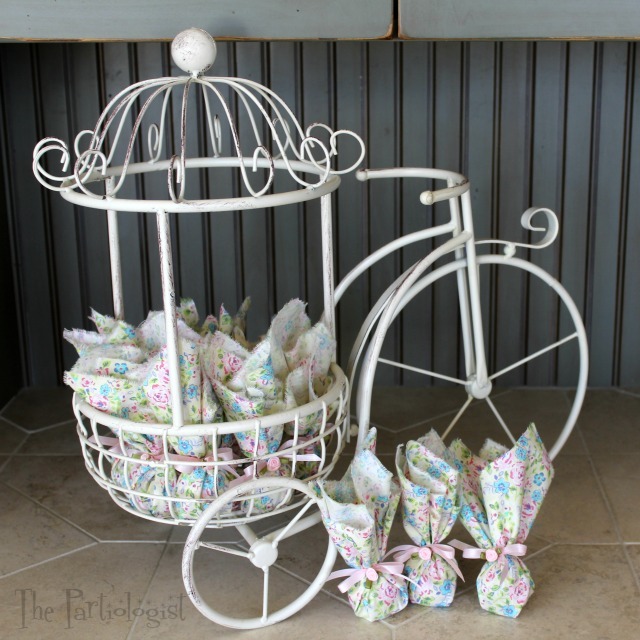 That bicycle makes a wonderful display for your cake pops and the fabric you chose is perfect for a shabby chic party. Thank you Beth, wasn't it the perfect display for the pops?? Pretty much should have bought the fabric the first time I saw it! "too beautiful to eat" category, but I ate one, I mean two...and they are truly the best ever! Thank you again for sharing with me!!! PS I knew this dessert was special just opening the beautiful wrap. (My food doesn't look like that! The fabric was soft and it was a pleasure before the first bite!!! I love your new way to serve cake pops. My neice reminded me the other day how much she loves my cake pops. Not only is your fabric pretty, but I think it would also help protect them from the summer heat if taking these on a picnic. I think it's time Aunt Karen made some for one of her favorite neices. I was thinking to wrap a few for the fourth of July, not even thinking about protecting them from the heat! I think it's time for you to make cake pops for your niece!